If you’re new to vaping CBD, then we have the perfect beginners guide to vaping CBD! You have probably heard of vaping, but you’re not sure where to start or what all the fuss is about. Don’t worry! We are here to help you learn all about what vaping is and how you can get started vaping CBD with our beginner’s guide to vaping CBD! Koi CBD vape juices are available in several different flavors, strengths, and sizes for your convenience. You can also purchase our Koi Stik CBD Vape Pen and cartridges for an even easier and smoother CBD experience. CBD Vape juice is ready to use CBD vaporizer liquid. It is designed to be used in vaporizers, but can also be taken orally as a tincture. Simply load your vaporizer with your favorite CBD vape juice and allow time for the liquid to soak into the wicking surrounding the coil. Now, hold down the firing button while inhaling on the vaporizer. Some models of vaporizer are activated automatically when you inhale on the mouthpiece. The vaporizer heats up the CBD liquid, turning it into a vapor or mist. The vapor is then inhaled and taken into your lungs. The inhaled CBD vapor is absorbed into your bloodstream via the lungs and makes its way throughout the body. The CBD works by binding itself to the CB1 and CB2 receptors located in the bodies endocannabinoid system. Choosing a CBD vape juice is a personal choice. However, we recommend that you start at lower strengths 250 mg or 500 mg and then work your way up to the higher strengths. Koi’s bottles of CBD vape juice come in four different strenghts, but it’s always better to start off with a lower strength and work your way up. 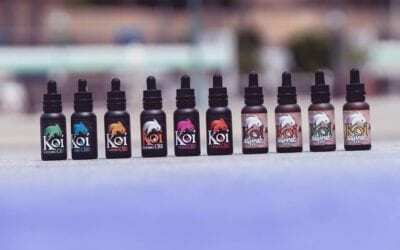 KOI CBD liquid is available in six different flavors. You can choose from Blue KOI CBD, Red KOI CBD, Gold KOI CBD, White KOI CBD, Jade KOI CBD, and Pink KOI CBD. Each flavor is absolutely delicious, and we even stock a variety pack which will allow you to try multiple flavors at once! All KOI CBD e-liquids and CBD vape juices come pre-steeped. Steeping is the process of allowing e-liquids to mature to give the flavors a chance to balance and mellow. KOI CBD products are all ready to use the day you purchase them. We don’t want to make you wait to start enjoying the benefits of our delicious CBD vape juices. It’s important that you store your CBD e-liquids and vape juices in a cool dark environment. You don’t have to keep them in the fridge or freezer, a medical cabinet out of the reach of children and direct sunlight is the most suitable place. It’s important that when you’re charging your vaping device or vaporizer that you don’t leave it unattended. Batteries can over-charge and explode. Only use authorized batteries and chargers, and always follow the manufacturer’s directions. If you haven’t tried vaping, then it’s not too late to get started! Vaping CBD e-liquid is an economical, discreet and easy way to enjoy all the benefits CBD has to offer.